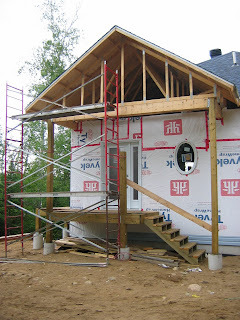 Cottage on the Edge - the DIY Cottage Blog: Installing Vinyl Siding: 3 Reasons Scaffolding is a Must! Installing Vinyl Siding: 3 Reasons Scaffolding is a Must! As I have commented before, a critical tool in installing siding particularly for multi-story cottages is scaffolding. Safety: Standing on a ladder 20 or more feet off the ground is dangerous, particularly when the ground is uneven, and you are at the same time trying to juggle a 12 foot piece of siding, a nail and a hammer. Scaffolding removes at least one of those balls. Faster Installation: Picture trying to install a 12-foot piece of siding, 20 feet up... It requires two people and two ladders. It means constantly climbing up and down the two ladders. With a scaffold that is set up the whole length of the surface you are putting siding on, it can be done with one person. That person can simply walk from one end to the other at the height needed. Increases the Quality: We found the perfect setup was one person up on the scaffolding doing the installation and measuring for the next piece while a second person on the ground did all the cutting and otherwise feeding siding and trim materials up to them. In the picture you can see one-half of the scaffold we eventually built so that we could work on the gable end. We installed the other half to the right side so that the scaffold person could walk from one end of the gable to the other. It turned out that while the scaffold person could install all the siding and soffit, getting set up - that is installing all the trim pieces such as the F-Channel, J-Channel, and starting strip - really required two people on the scaffold. Again, having the scaffold made the job safer and faster. We just carried up all the pieces we needed and installed them all at once - not once did we have to return tot he ground. I was concerned about the cost of renting scaffolding but in the end it was very inexpensive. For the scaffolding we rented to create a platform 20 feet long and 15 feet high, the cost to rent for roughly 1 month was a little over $100. Well worth the investment!